Three years after a Syrian Orthodox foundation applied to build a church in Istanbul, the Greater Istanbul Municipality has granted them a large plot of land and a building permit. Banner headlines in the Turkish media praised the early-December decision as “a first in the history of the Republic,” declaring that never before had Turkey allowed a non-Muslim minority to build an official new house of worship. Still, Syriac Christians were far from pleased. For one thing, the land they were “granted” by the municipality is, in fact, a Latin Catholic cemetery. In fact, the graveyard had been donated back in 1868 to the Italian Catholic Church in what is now Istanbul’s Yesilkoy district. It was then officially registered as Catholic property in 1936, although later confiscated in 1951 by the city. The Council of Europe’s 2011 progress report noted that Turkey was not fully implementing Law No. 3998, which states that cemeteries belonging to minority communities can no longer be taken over by local municipalities. According to lawyer Nail Karakas, the Latin Catholic foundation had applied to the city last summer, in accordance with the government’s August 2011 pledge to restore expropriated minority properties, to regain possession of their property and resume Christian burials in the graveyard. 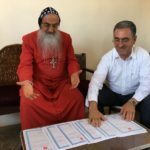 So Syriac leaders are insisting that the cemetery land newly designated for their church be returned instead to its rightful owners. “It is clear that (the authorities) want to cause conflict between the minority communities,” commented Syriac layman Sabo Boyaci. Boyaci also faulted the government for trying to exploit the Syriac community politically. “I don’t believe the government’s sincerity. They delivered this land to us in order to silence us on the matter of Mor Gabriel Monastery. The government simply aims to make a good impression on the European and Turkish public,” he told Hurriyet Daily News. European Union officials have expressed “serious concerns” since the final Nov. 15 verdict by the Turkish Supreme Court of Appeals against the 4th century Mor Gabriel Monastery. The court ordered the confiscation of some 680 acres belonging to the monastery built more than 1,600 years ago near Mardin, in eastern Turkey’s Tur Abdin region. The decision was termed an “unlawful appropriation” by the Council of Europe. Five disputes over the ownership of the ancient monastery’s lands have bounced back and forth in the courts since 2008, when Muslim villagers in the vicinity of the monastery protested to the state Treasury and Forestry Administration, claiming that the monastery was illegally occupying their lands. Litigation was then instigated by state institutions, which had redrawn local boundaries earlier that year to update the national land registry, and passed new laws authorizing the transfer of “uncultivated or forested lands” to state ownership. “I know from my experience very well that if some ‘citizens’ bring an organized action against non-Muslims in Turkey, it is almost certain that the state somehow has a hand in it,” columnist Orhan Kemal Cengiz wrote Dec. 7 regarding the case in Today’s Zaman. The lawsuit was openly supported by Mardin parliamentarian Suleyman Celebi, a member of the ruling Justice and Development Party. Celebi claimed that although the monastery’s legal boundaries were established in Ottoman times, the Syriac Christians had failed to observe them properly. According to a deputy chairman of the monastery foundation, if an individual appeal to the Constitutional Court does not overturn the Nov. 15 decision, the monastery will take the case to the European Court of Human Rights. The Syriac Orthodox Patriarchate had once resided in Midyat, until it was forced in 1930 to move to Damascus, where it still remains. The oldest surviving Syriac Orthodox monastery in the world, Mor Gabriel still keeps alive the ancient Aramaic language closest to that spoken by Jesus. Some 2,000 Syriac Christians still reside in their traditional homelands in and around Mardin. More than 15,000 others have immigrated to Istanbul in recent decades. Without any official church of their own, the Istanbul parishes worship in rented Catholic Church buildings located throughout the city. 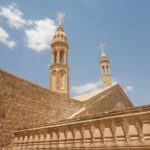 The Syriac Church of the Virgin Mary Foundation says their proposed new church needs to be large enough for 1,000 worshippers.